How quickly does a quantum particle tunnel through a barrier? This fundamental question has been hotly debated (as time is not a quantum operator) since the early days of quantum mechanics. Conclusive experiments were not possible. 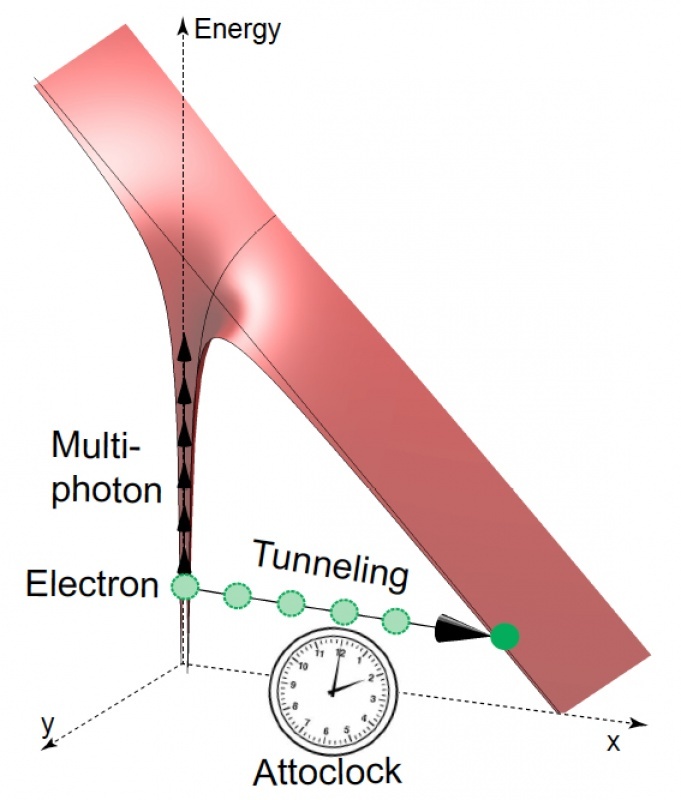 In modern ultrafast science, the reconstruction of electron dynamics, e.g., in several recent Science and Nature papers, implicitly relies on instantaneous tunneling time. Our experimental resolution shows tunneling time is neither instantaneous nor deterministic; most existing theory fails. Moreover, the time-scales involved significantly impact dynamics of valence shell electrons – and hence the chemical properties of molecules, with implications likely even for molecular biology research. Tunneling through classically forbidden regions is perhaps the best-known and most evocative feature of quantum mechanics. But how long does tunneling take? This “tunneling time problem” has been heavily debated since the 1930’s. Tunneling itself is crucial in the “real world” of chemistry; but is it so fast that the time doesn’t really matter? Here, we experimentally resolve tunneling time, finding most theories are wrong, and a duration and quantum uncertainty that will likely influence the future direction of ultrafast science in chemistry and molecular biology, as well as impact cutting edge technology that relies on tunneling. Landsman, A.S., Weger, M., Maurer, J., Boge, R., Ludwig, A., Heuser, S., Cirelli, C., Gallmann, L., and Keller, U. (2014) Ultrafast resolution of tunneling delay time. Optica 1, 343-349 (10.1364/OPTICA.1.000343) Landsman-2014b (1.7 MB). Fig. 1. Potential energy surface of laser-induced ionization showing the tunnel ionization mechanism. The atomic Coulomb potential is bent by the strong laser field such that a bound electron may get liberated by tunneling through the classical forbidden region. Such a tunneling process, whose time duration is as short as a few attoseconds, can be resolved with the Attoclock experimental technique. The experimental results reveal the existence of a real (not instantaneous) tunneling delay time over a large laser intensity regime in agreement with only two of the many theoretical predictions available.